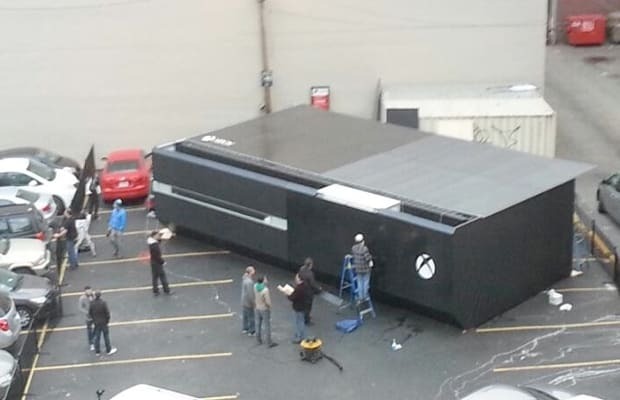 Pictures surfaced earlier this week of a giant Xbox One being built in a parking lot in Vancourver, Canada. Well last night it burst open and out gushed zombies onto the streets straight out of Dead Rising 3. But once the zombies cleared out from the Xbox One day-one exclusive, the inside was full of beautiful liquid black Xbox One’s for gamers to try out. Dead Rising 3 is available as soon as gamers pick up their Xbox One and features all-new zombies that may be a tinny bit smarter than the general hordes. New zombie types will include cops with guns, prisoners, and football players all ripe for the killing. Don’t worry, Dead Rising 3’s new protagonist, Nick Ramos, is going to get a bunch of new goodies too. The game is complete with crazy outfits and oddly crafted yet deadly effective weapons to take on the largest zombie hordes yet seen in the series. Pick up Dead Rising 3 when the Xbox One drops on November 22. Check out the trailers below for more footage.